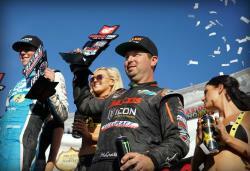 The season opener of the 2017 Lucas Oil Off Road Series was strong and a good insight of what is to come the rest of the year. 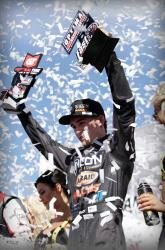 Between Brock Heger and Jeremy McGrath they received five trophies on the first weekend of racing. 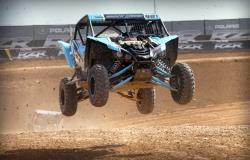 Brock raced in two classes, his Pro Lite and Production UTV, which is a new class for the national series. Brock was not sure going into the weekend if his AIRAID Yamaha YXZ would be ready for the first race due to the uncertainty of even competing in the new class because he got it back from the performance shop for tuning on the Friday of the race, barely making it to practice. Each time Brock got on the track he improved his times throughout the weekend from the first practice all the way to the races where he finished fifth in Round 1 and then third in Round 2. If he keeps this pace up he will be on top of the podium real soon. Brock didn’t stop his progression there since he also raced in his Pro Lite and was very fast but the weekend did not start out the way he hoped for. In practice, another driver hit Brock causing him to roll multiple times and damaging the truck. The team was able to get the truck back together and Brock was able to get focused and put it behind him. Brock qualified first and started on the front row of Saturday’s race. When the green flag started waving, Brock was on the gas and not looking back. He led every lap of the race finishing with the fastest lap and his first win of the season. For Sunday’s race he would start on the second row, where he would battle with the leaders the majority of the race. But there was some contact during the race where Brock ended up with a flat tire and during a caution he was able to make it into the hot pits where the team was able to get it changed and keep him on the lead lap. With only six laps remaining, Brock knew he had to charge as hard as he could towards the front. One by one he passed the other trucks making it all the way up to the leaders on the final lap. 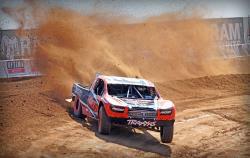 Jeremy McGrath had a very successful opening weekend in his AIRAID, Maxxis Tires Pro 2. Jeremy was up in the front all weekend from qualifying laps to the races. Starting the season out strong meant that Jeremy had some great battles with some other great drivers like Bryce Menzies, Rob McCachren, and RJ Anderson. Jeremy stayed in the top five throughout the race battling around third and also for the lead. With the top drivers all battling for position they would swap back and fourth throughout the race. At the end of the race Jeremy would end up on the podium in third place. The team is planning on bringing the same momentum into the next rounds at Estero Beach, Mexico. The track in Mexico is completely different than the other tracks in the series. Brock is looking forward to the next rounds at a track that he really likes since Brock got his first Pro Lite podium at Estero Beach back in 2015. Brock is hoping to bring his 2017 momentum into the race, and that includes his sweep in the season opener and also his win in his desert car this past weekend. Watch out for this young driver to show everyone how fast he is no matter if he is in his Yamaha YXZ, his Prolite, or his desert car. Also watch for Jeremy to be up front and on the podium in his Pro2. With these two teammates showcasing their speed, watch for their energy to feed each other and be even stronger working as a team.